Radical Responsible Mothering is the ever present awareness that there is no greater responsibility or privilege than to raise one’s children with a devotion and dedication that rises above the needs, impositions and mandates of society. Consequently, when the individual child is cared for, raised in love, allowed to flourish and create, to learn the tools of reason, logic, civility, discourse, debate annd dissent - both society and the individual are the benefactors! Oh, I love this! Thanks for sharing it; I'll be printing it out and putting it on my fridge! 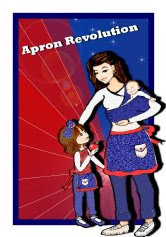 Promoting Radical Responsible Mothering for Ourselves, our Children and our Nation! My life experiences are a somewhat eclectic blend of parenting, publishing, politics, and entrepreneurial endeavors. During my years as a stay-at-home and homeschooling mother of two, I was also active in community and non-profit organizations with a focus on children. My editorial and writing experiences come from my involvement with local and regional publications, co-editing a popular Senior Citizens magazine with my mother. In addition, I have written for and edited several political publications and most recently have had my work included in the book, "Why Liberty: Personal Journeys Toward Peace & Freedom". My political endeavors include working with the Libertarian Party of Illinois and other liberty-inspired organizations at the local and state levels as well as serving as Group Owner of the Libertarian Moms Group on CafeMom. 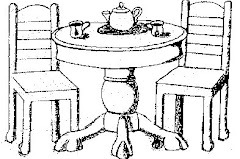 This active group has over 1,000 members and continues to grow. I am founder and director of The Mothers Institute, an organization with a focus on anti-war, pro-peace work. My husband and I live in Illinois and are extremely proud of our two grown sons who have chosen careers in architecture and engineering. 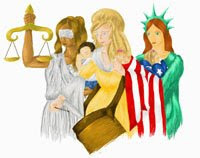 Original artwork commissioned by The Mothers Institute and used as the Mothers for Liberty logo. Favorite Links ... Check 'em out!